"buenos días ya he recogido el pedido todo perfecto cada día me gusta mas y..."
Mandala necklace watch with chain vintage style. It is a watch of 4 cm in diameter, vintage pocket style with box zinc alloy plated in antique bronze color, and quartz machine. This watch has as cover a mandala formed by holes in openwork in the metal. The watch is accompanied by a long chain of metal plated in the same color. Owl watch to hang with carabiner hook. It's a cute owl with a quartz watch as tummy. Measure owl watch: 3 cm x 4 cm without the carabiner. This watch can be used in various ways as it has a carabiner hook and can be hung on key chains, zipper bags, staples, etc ... The material that is made the owl watch is plated zinc alloy aged bronze color. Dolphin Watch with carabiner hook for hanging. It is a very versatile quartz watch has a carabiner hook that allows hanging of handbags zippers, clips, key chains etc ... 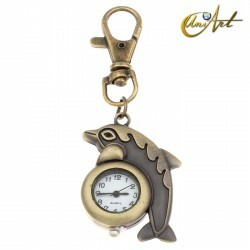 The watch case as dolphin is made with zinc alloy plated antique bronze color. Approximate measure of dolphin watch: 3 cm x 4 cm. Moon watch necklace vintage style. It is a beautiful quartz watch, wrapped by a moon. The box is plated zinc alloy aged bronze color and the watch is rotating, the best vintage style. The approximate measure of the watch moon is about 3.5 cm in diameter and subminister with a metal chain for use as a necklace..
Star watch necklace vintage. It's a quartz watch with star-shaped box made of zinc alloy plated bronze aged, which gives a vintage and antique air. 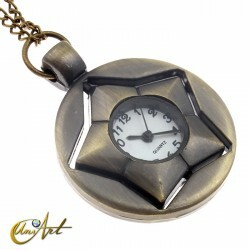 This watch measures about 3.5 cm in diameter, and brings a metal chain for use as a necklace. The star is rotatable. Vintage watch, heart model. Heart model watch size is about 4cm x 4cm. 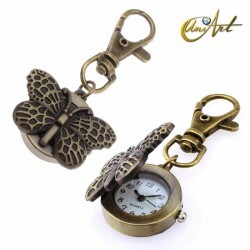 The box has the shape of a heart, vintage style and is made from zinc alloy plated in antique bronze color, the machine is a quartz watch. 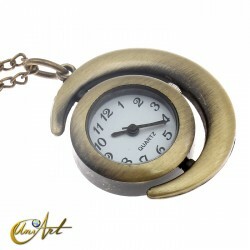 This model emulates the old pocket watch but has a long metal chain to be worn as a necklace. Watch dragon necklace with vintage style chain. With about 4.7 cm in diameter this vintage style watch to pocket has the box zinc alloy plated in antique bronze color and quartz machine. The cover has a dragon in relief. 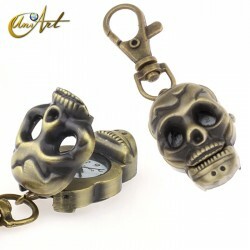 The watch has a long chain of plated metal in the same color and to be used as a necklace. Discover our vintage watches with esoteric symbolism as moons, butterflies, turtles, owls or dolphins, among others. 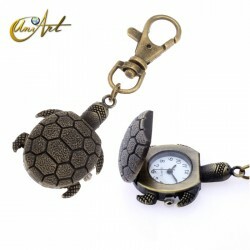 These special watches are characterized for being hooked to a carabiner, so they can be hung and used in different ways as in bags, key chains, backpacks or where you like. They are clad in dark bronze and although each vintage watch has different measures, they usually are between 2 cm and 5 cm. In the individual description of each watch, you will find all the concrete and accurate information of each model.